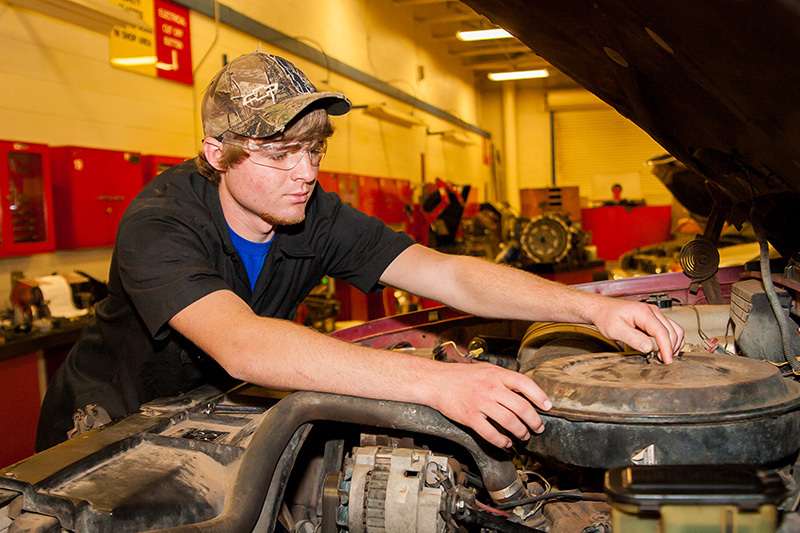 Automotive Service is designed to teach entry-level skills to students. Students will learn a variety of auto-related skills such as brakes, steering and suspension, electrical/electronics systems, and engine performance. They will also gain skills in automatic and manual transmissions, engine repair, and heating and air conditioning. Students can have the opportunity to participate in on-the-job training. Part-time students can complete the program in two years, and full-time students can complete it in one year. Auto Service is a NATEF certified program. ODCTE Competency Tests: Brakes Technician, Steering and Suspension Technician, Electrical/Electronics Systems Technician, Engine Performance Technician, Heating and Air-Conditioning Technician, Engine Repair Technician and Manual Drive Train Axles Technician. AST: Brakes, Steering and Suspension, Electrical and Electronic Systems, engine Performance, Engine Repair, Heating and Air Conditioning, Automatic Transmission/Transaxles, Manual Drive Train and Axles, Maintenance and Light Repair (ASE Student). For more information, call David Wright at 580-562-3181, ext. 255, or email [email protected].